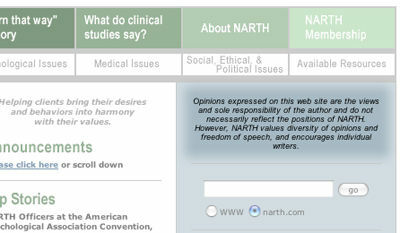 Several days after it came to light that the antigay National Association of Research and Therapy of Homosexuality was hosting racist content on its web site, NARTH quietly removed the racist article, which had been hosted for 15 months without protest from NARTH’s leaders and membership. This flight from responsibility is less than satisfactory for the National Black Justice Coalition, which last week issued a letter of protest to NARTH executive director Joseph Nicolosi and this weekend published the letter on its web site. As an “individual writer”, and in a spirit of appreciation for diverse opinions, I should look forward to NARTH publishing my articles. After all, the opinions on the site don’t have to be those with which NARTH agrees. OK, so I’m waiting for word from NARTH. Mr. Nicolosi, I have my article ready. I would be also happy to submit an article, since NARTH seems to be welcoming any article– regardless of its content or point of view. This explains everything! They don’t care what their advisors or writers say — they will print ANYTHING, no matter how ourageous, inaccuarate or inflammatory — and just leave it up to their readers to figure out which ones NARTH agrees with and which they don’t. Hey!!! Has Maybe Wayne Besen thought of submitting and aritcle since they now welcome “diverisity of opinion” and “freedom of speech”? Would they post HIS article without comment from NARTH as they seem to have done with Schoenewolf?